Plug & Play,Hot-Swap capability for rapid multi HDDs access & exchange. 2.Slide the IDE power push button to the correct side(2.5 inch IDE slot or 3.5 inch IDE slot) if the LED power light turn on. LED indicator Compatible with Windows 98/SE/ME/2000/XP/Vista/7,Linux, Mac OS 9.x or above. Compatible with 2.5"/3.5" IDE/SATA hard drive,NOT compatible with Western Digital IDE hard drive. This dock can not clone any hard drive,only used to transfer datas between different hard drive, it can not fix any hard drive problem. 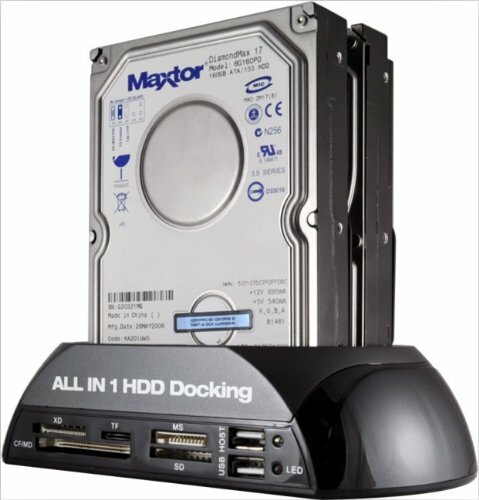 Easily transfer data from your 2.5"/3.5" IDE or SATA hard drive to your computer through USB 2.0 and eSATA port.